Here she comes. The future. Words from a spiritual musical journey at the turn of the last decade sung by one of my favourite bands on a cold December night somehow pop up my head. Driving up the road from Apartadó, it is an extremely warm day in March more than 20 years later and on a different continent. I am visiting a small-scale farming community and although I have done so for the past two years, today is different and maybe that’s why I am recalling these words. In the current climate of crisis around the globe, whether real or perceived, whether economic, or more a crisis of conscience, clearly something has to change. Really change. My current journey with PBI in Colombia is almost coming to an end and I realize it has been an inspirational one. I feel I have been shown a kind of future I would like to see realized, by people fighting for this change. Not the hollow political and commercial one-liner type of change, but a tangible and honest one. At my arrival, the scene is as ever. Horses run by, followed by a horde of pigs being chased by a set of dogs, which in turn are followed by a group of kids running after the whole lot laughing and screaming, looking like the tail of this little convoy full of life. Ducks, turkeys, chickens and roasters squawk themselves out of the way. 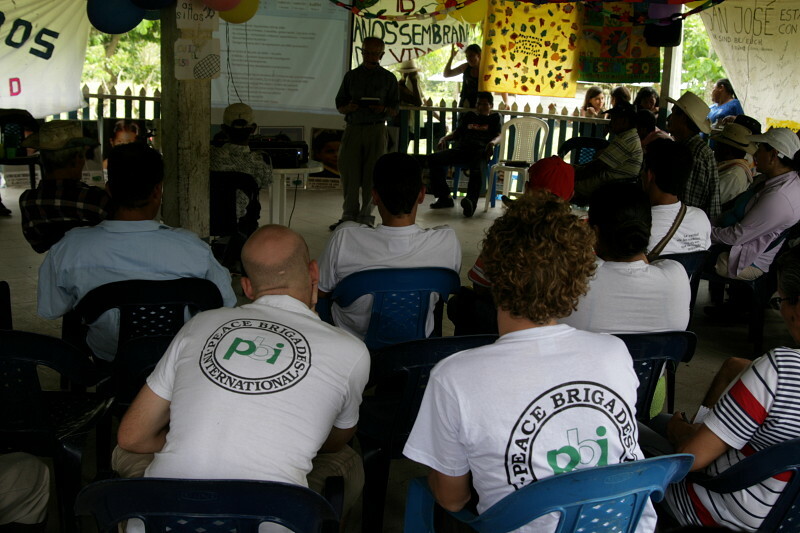 Welcome to the Peace Community of San Jose de Apartadó. Why today is special is the reason for the visit: the celebration of the Community’s sixteen years of existence. With its neutrality in war as one of its core principles, the Peace Community is a response to the armed conflict that has plagued the Urabá region since the 70s, and escalated in the latter part of the 90s. It denounces violations and crimes committed by any of the armed actors involved, with land rights, justice and dignity in mind as some of the key elements of their struggle. With different national and international organisations present for the anniversary celebration, as well as other communities from various parts of the country, a recount is given of the history of the community and the situation which led to its founding. In these sixteen years of suffering all possible mechanisms of war have been used against the Peace Community and today the community members, including children, who have been assassinated are being honoured, as well as other innumerable injustices suffered remembered. Today is also a day of joy, of celebrating the achievements of sixteen years of resistance in which they have managed to overcome war and death, hunger and abuse, by creating this inspirational alternative that is the Peace Community. Maintaining alive the memory of the past, as a teacher of life, building a better future by making it a reality in the present. Without a doubt, this has required a whole lot of nerves of steel. In the meantime there is also time for play and games in the days’ celebrations. An egg and spoon race, sack race, smashing the piñata, and other games make for great laughs (and takes me back to my own childhood, where the kind of problems these kids endure were totally absent). But it is a lot more than that. It also shows the strength of this peasant community. What you see is a fight against extermination, with strength of unity, warmth and affection, great spirit and will power, “transforming pain and suffering into hope,” as Eduard Lancheros, recently deceased community leader, used to put it. An important tool of overcoming all of the suffering is creativity. There is more than one system that can make society work is a clear message from the experience here and one that is shown the day after the celebrations when the workshops of the ‘Peasant University’ begin. It is an alternative way of understanding education, providing space for mutual exchange of knowledge on essential topics such as education itself, but also on justice, health, and food sovereignty, amongst others. The law is moving ever further away from the people I am told, but not all that is legal is also legitimate. And the fight is not just for what is legal, but maybe more so for what is legitimate, for what is right, that what defends the dignity of the people. It is amazing to hear and see how clearly the Peace Community’s understanding is of their situation, their belief in the legitimacy of their struggle and the way they want to go forward, even as they know full well it can cost them their lives. Or as one person put it: “today we are talking, tomorrow we can be dead”. The experience accompanying different communities in the Uraba region has been an eye opener, and celebrating the 16th anniversary of the Peace Community, I realize once more just how lucky I am to be able to walk alongside some of the most amazing people. Here she is. The future.